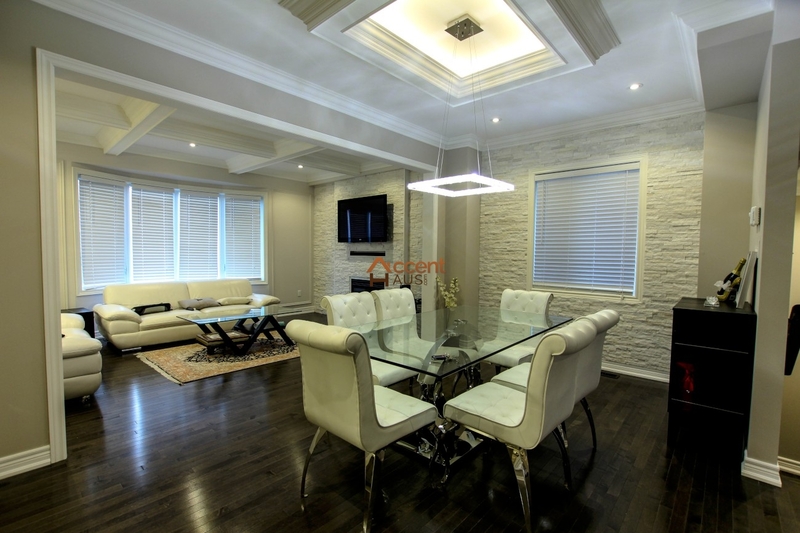 Below is a guest post on the subject of what can be done with ceiling design. 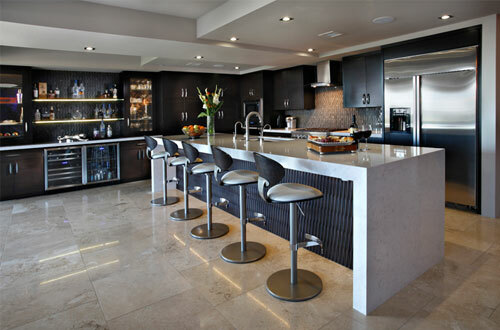 Here in Arizona many of the homes have very high ceilings ranging from 12′ to 20′ or more. Sometimes the builder of the home has thought about the high ceiling height and added architectural details to make it more interesting. Other times the ceilings ares lacking any kind of design attention and can make a space seem empty. If you live in an older home here in Arizona, you may have the dreaded popcorn ceiling texture. It that is the case, the very best and the first thing to do is to have it removed and the ceiling re-textured and painted. 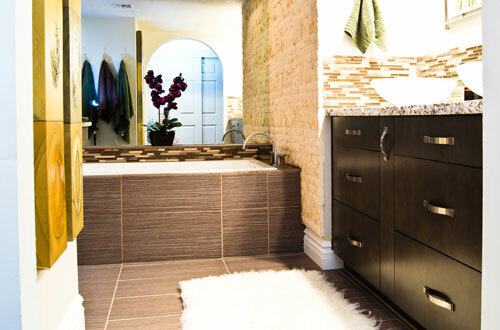 From simple ideas such as paint or wall covering options, to architectural beams and coffers, the options are vast. So look up…..is there something special you can do to your ceilings in your home? Never underestimate the importance of ceilings. They have a huge impact on the overall impression your home gives. It’s not just furniture, window treatments and wall decorations that individualize a particular room, but the right blend of colors, décors, interior design ideas, and lighting choices. Are you under the impression that nobody looks up? Here’s where you are wrong. Even if you don’t intentionally raise your eyes to check out a ceiling, your glance embraces the whole environment the minute you step in a room. Boring plaster finishes with hardly any décor or personalized touches will probably make the entire room indifferent. There are ways to make your ceilings luxurious. Let’s just start by saying that there are expensive and inexpensive ways for doing so, and so it will depend on your budget, how much you want to spend on a specific room, and whether there are reasons for completely transforming a particular ceiling or not. First things first. Look up! What do you see? What’s the height of the room? What’s the current condition of the ceiling? Which room is that? In order to make the right decisions, take one step at a time. Is your ceiling high or low? And what impression would you like to give? 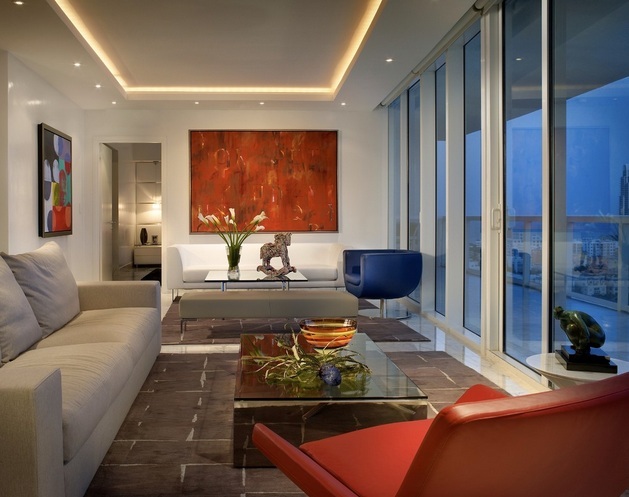 High ceilinged rooms are considered luxurious because they are impressive on their own, but watch out. They can make the room cold and impersonal. In this case, you have two options: you should either use tricks to lower down the ceiling or take advantage of the height and just make it elegant. If the ceiling is low, things are a lot harder. Low ceilinged rooms warm up faster and better in the winter and make your life easy when you simply want to change a light bulb. 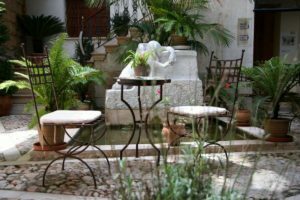 But if the space is not large or it is overcrowded with furniture, and there are no big window openings, it will be claustrophobic. Are there damaged ceiling parts? Roof leaks are often more than enough to have catastrophic effects on ceilings. So before you talk about remodeling your ceiling and make the fifth wall more luxurious, it’s imperative that you fix it. If you need to hire a pro to do some ceiling repairs, you might want to consider some extra labor work. 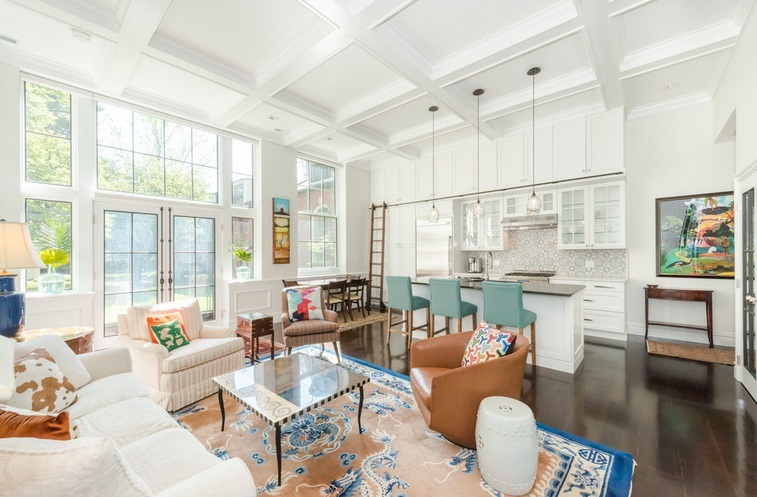 This might be your chance to install a coffered ceiling. 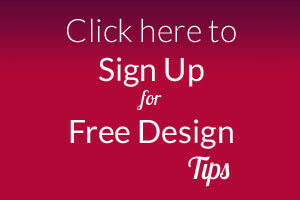 Are you interested in improving the looks of your dining room, bathroom, living room, or hallway ceiling? It’s actually up to you whether you want to spend money on transforming the ceiling of a private space (like your bathroom’s ceiling). 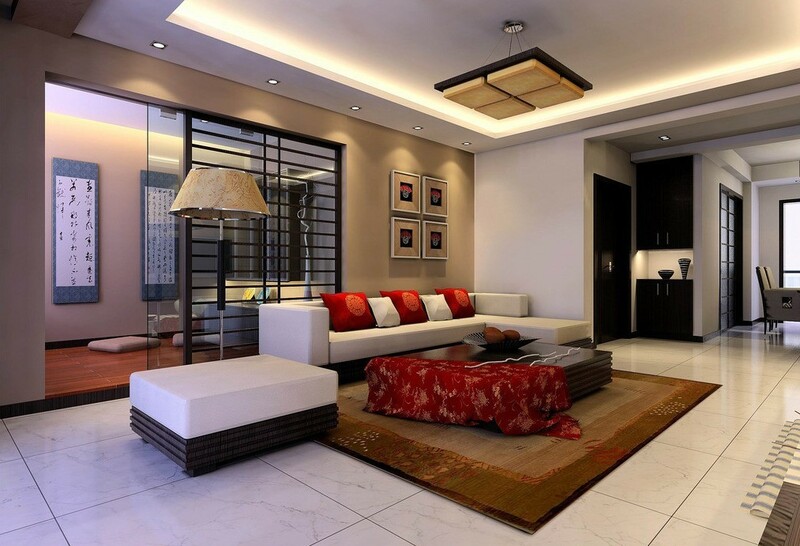 If you ask any interior designer, they will tell you that it’s worth transforming any ceiling. And that’s true! The question is how much are you willing to spend? It will also depend on whether you want to change the looks of one room’s ceiling or all of them. In the case of the latter, think smart. Choose inexpensive, but smart solutions for ceilings at private spaces and spend more to transform ceilings in the dining or living room. Whether you have a vaulted coffered ceiling or a plain, white one, as long as it is high you can do wonders by playing with colors. Since the space already breathes from the height of the ceiling, you can use intense colors and install ceiling medallions in historical designs. Use ceiling stencils. There are amazing patterns on the market. You can either decorate the entire ceiling or parts of it. 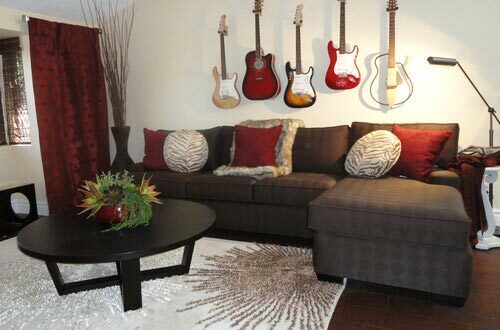 Depending on the design you choose, you can leave the ceiling white or paint it dark red or blue. If you select dark colors, you bring the ceiling down. So, if you want to give the effect of a lower ceiling, choose dark shades and dare to go for a black ceiling too. Black is back and gorgeous. It will make a greater impression if you install white crown molding. It will bring out the elegance of the black color. 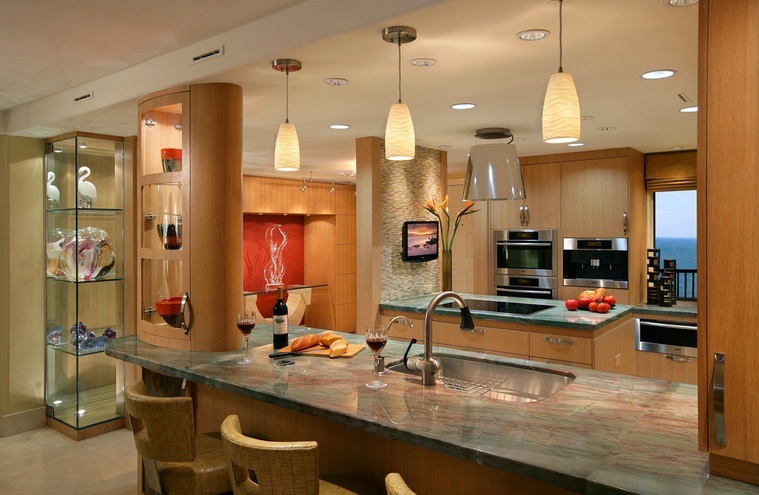 You can also lower the ceiling by using complex patterns in intense colors. 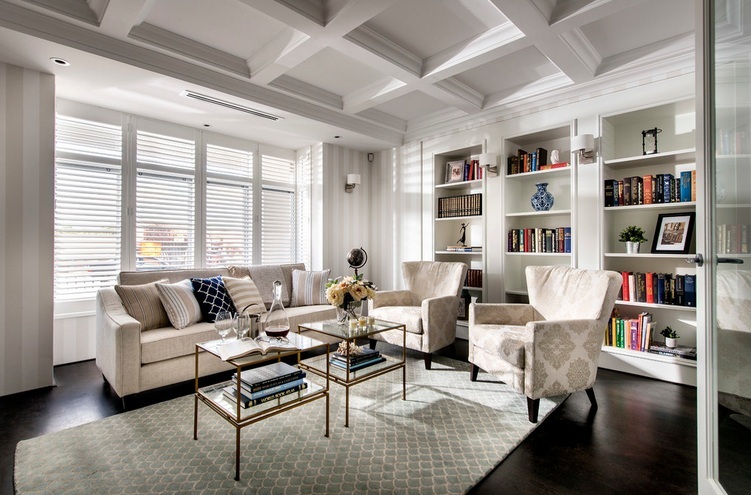 Go for coffered ceilings with particular designs. The more colorful the better! Get inspired by Italian frescoes. If you can afford a modern “Michelangelo” to do some art work on your ceiling even better. It can’t get better than “The Creation of Adam”! If you have the money to install wood panels, go for it. But make sure the rest of the room’s setting is simple-white-chic. By keeping décors in neutral colors, you bring out the character of wooden ceilings and won’t make the room heavy. How about dressing the ceiling with wallpaper? Just avoid intense colors and complex patterns. Wallpapers on ceilings are an excellent idea for bedrooms. 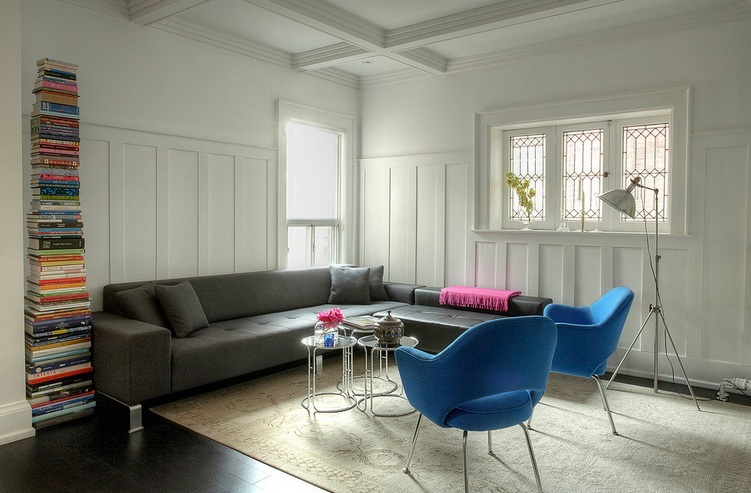 White plaster ceilings look more exotic with some woodwork done on the top. Use slim stenciled patterns. Make a difference by investing in golden or silver colors. Give an elegant and original impression by petite flowers and green leaves at the edge part of the ceiling and all around the crown molding. The truth is that most people are not happy with what they have. If we have high ceilings, we struggle to lower them down. If we have low ceilings, we do our best to increase their height. Since you cannot rebuild the house, here are a couple of things you can do to make the ceiling look higher. Paint the ceiling in high or semi-gloss neutral color. Glossy light shades will deceive your eye in believing that the room is higher. You can also remove the plaster and expose the initial ceiling structure. This will literally give you a few more inches of space. Avoid installing coffered drop ceilings. Crown moldings will look lovely, but avoid oversized ones. Use striped wallpapers or paint the wall in stripes. Vertical stripes make us look thinner and taller. They have the same impression on our homes, too. Avoid tall furniture. Keep everything in average size so that items won’t suffocate the room. It’s best to have floor to ceiling bookcases and fill all shelves with books and displays up to the last one at the top. Put framed pictures all the way up to the ceiling and even over door casings. They give the impression that the ceiling is high. Avoid pendant lights and chandeliers. Paint a diagonal wall stripe to give the impression that there is a staircase going up. It will create the illusion that there is more spaceand give a movement feeling to the space. If you are interested in installing wainscoting, prefer vertical beadboards that will give the same impression striped walls do. Hang drapes as high as possible and let them touch the floor. Install 1/3 sized wainscots and keep the upper wall side the same color as the ceiling. 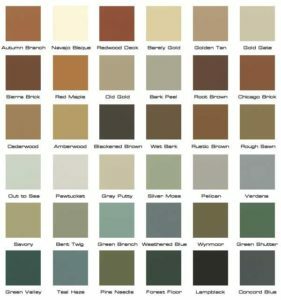 If you want to add color, paint the beadboard. Not all ceilings are flat. Some are cathedral, some are curved and some are octagonal. You can use thick stripes, intense colors, and Asian inspired stencils or go for more sophisticated solutions like designs imitating Italian art and the Renaissance period. The truth is that the higher the ceiling is the more things you can do to decorate it. The kitchen and dining room will simply look lovely if is painted blue and complemented by wood boards. Pendant lights definitely give a dramatic effect as they travel all the way down from a vaulted wood ceiling. So, do explore your choices. Spent time thinking of colors. They make the greatest difference. The right shades will add glamour; the wrong ones will be disastrous. Pay enormous attention to lighting. If you like chandeliers but the ceiling is low, hang one at one corner and over a small table or chair. 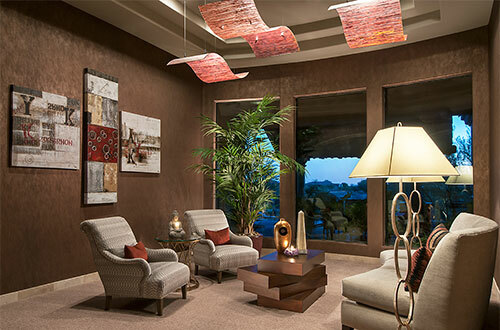 Remember that your ceiling becomes more elegant with hidden lighting all around the trim. Don’t forget that ceilings do not stand alone. They are part of the room. The most gorgeous ceiling in the world will lose its appeal if the rest of the room is messy, overcrowded and too colorful. 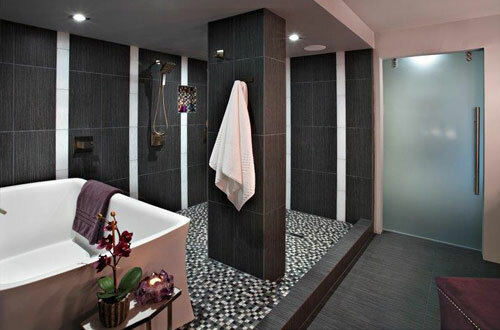 Use different architectural ideas in each room. After all, all endeavors aim at improving the looks of the entire space and not just the ceiling. Every room serves a purpose and must have a unique character. So, play with variations. Use contrasting colors in the dining room but smooth transitions from wall to ceiling for the bedroom. Our ultimate advice? Let your imagination travel, stick to your personal tastes and enjoy every minute of it!